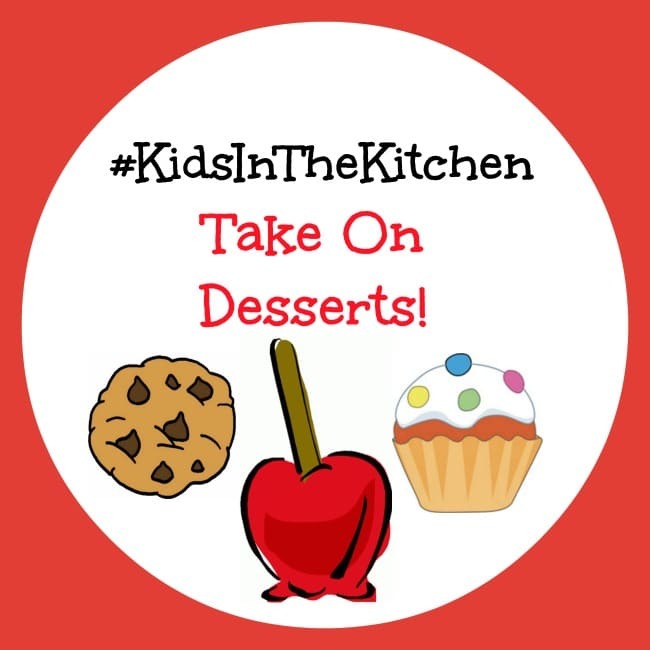 Kids In The Kitchen Take On Dessert! 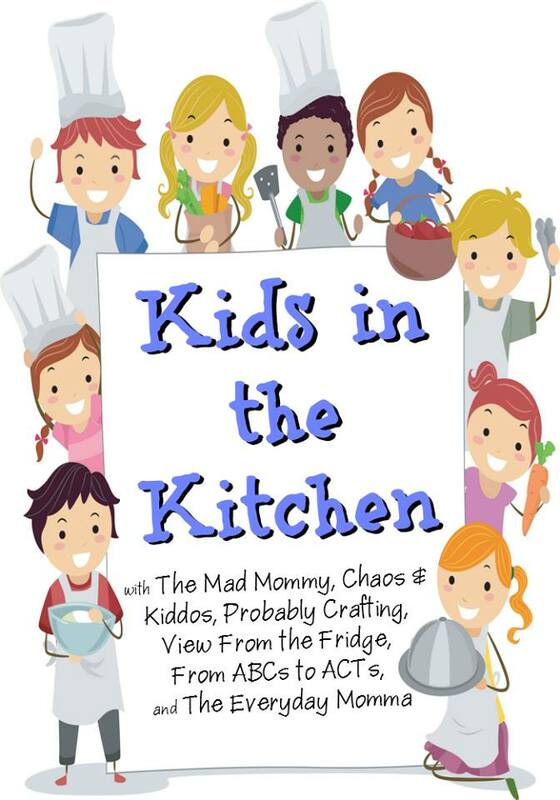 It’s Monday and that means it’s time to get your #KidsInTheKitchen! This week, it’s all about delicious desserts and I can’t wait to see what everyone came up with! Fall is officially in the air and that means it is time to bust out those fall flavors! I decided to come up with a deliciously decadent, fall inspired dessert recipe that would knock everyone’s fuzzy socks off and believe me, this is it! This dessert looks complicated, but you won’t believe how easy it is! 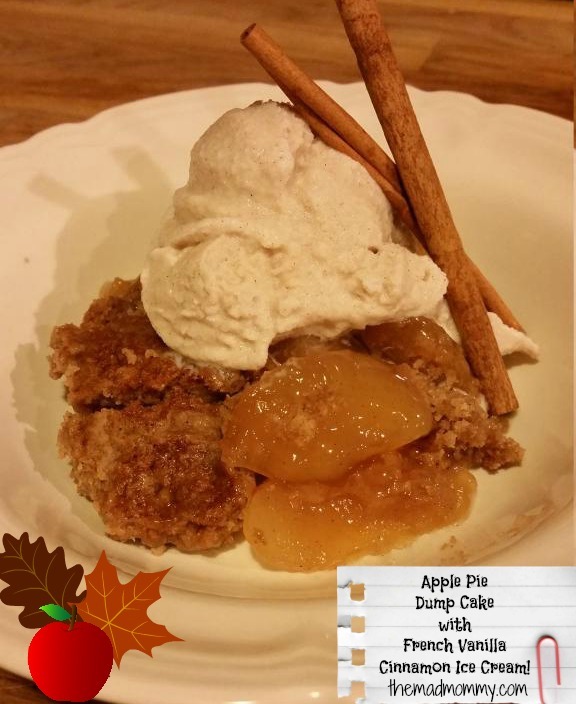 We’ll start with the Apple Pie Dump Cake! 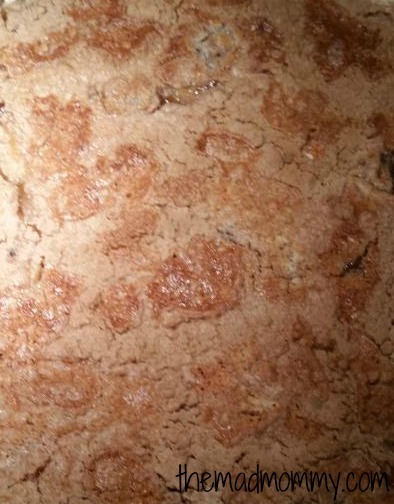 Grab a 9×13 cake pan. Cut the butter into pats. Spread both cans of apple pie filling into the bottom of the pan. Sprinkle the cake mix all over the apples. Place the pats of butter all over the top, then put the cake in the oven for 1 hour until the top is gorgeously cooked. Now, for the French Vanilla Cinnamon Ice Cream! Would you believe we made it with just 2 ingredients? Mix them together and then put them in your ice cream maker for 20 – 25 minutes. Spoon into a container and place in the freezer for a few hours to harden a little. This will surely be a crowd pleaser! 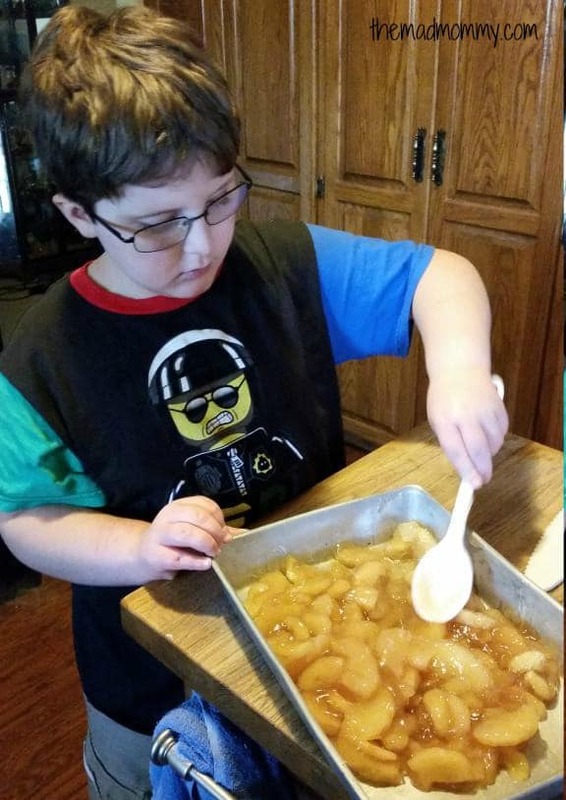 This is part of the #KidsInTheKitchen series! Please visit Katy from Chaos & Kiddos, Becka from Probably Crafting, Katie from View From The Fridge, Amber at From ABCs to ACTs, Julia from The Everyday Mommaand Savanna from Rose Uncaged and see what Delicious Desserts they came up with! 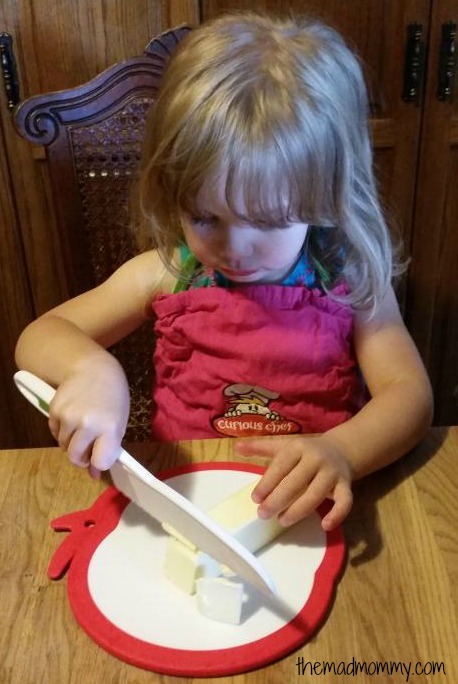 Also, check out Curious Chef for tons of high quality, kid safe cooking tools! You can also find them on Facebook and Twitter! Don’t forget to enter our fantastic giveaway! 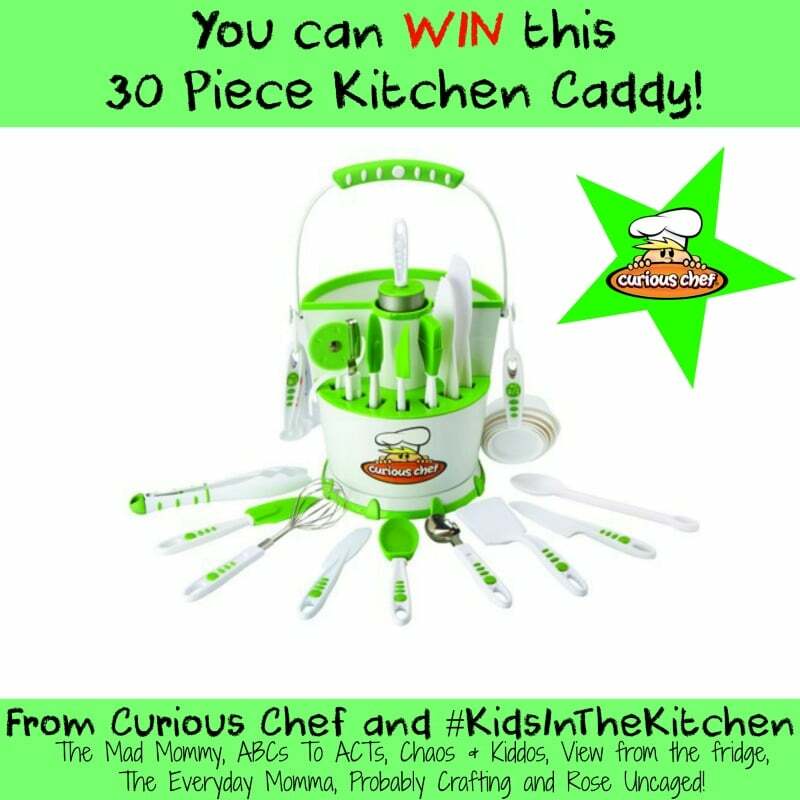 Win a 30 Piece Caddy Collection from Curious Chef! 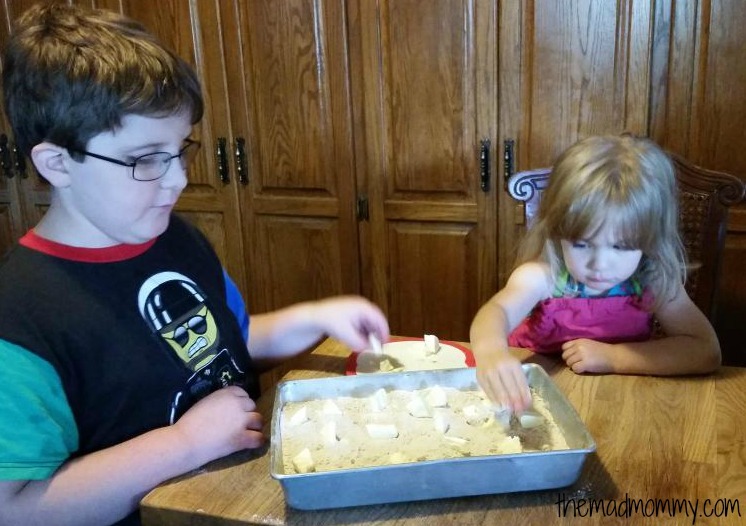 Do you have a great #KidsInTheKitchen post, kid friendly recipe or kid friendly cooking tips? Please link them up! It’s Dinnertime with Kids In The Kitchen! It was so easy and so delicious! Like a cross between an apple pie and an apple crisp! Yum!!! This looks awesome! It’s so great having kids help and participate! I’ll be linking up soon! It is so much fun! Plus, getting them involved now, gets them more comfortable and teaches them valuable life skills! That dump cake looks delicious!! Henry helped me in the kitchen this weekend. He was making drop biscuits while I was making sloppy joes. He carefully measured out the cream of tartar and dumped it into…the sloppy joe pan!! He was so embarrassed. I managed to scoop most of it out, and I don’t think it will affect the taste. Maybe I should have been paying more attention! Mistakes happen! That is part of the fun of being in the kitchen! I’m glad he is in there helping you! You make me want an ice cream machine! 🙂 Looks amazing! I love Apple anything. Now is the time to buy! They all go on clearance after the summer! Okay, fess up. What have you been feeding your kids that they are really good in the kitchen. Can I send mine over so they can learn? All they do around my kitchen is make a mess. Hahaha, I don’t feed them. It’s all pretend. I am really behind them with a cattle prod, saying “Make this happen!”. Just kidding. *shifty eyes* They have always liked to help. Is it selfish that my kids have only had it once and I’ve had it 3 times? I love the way they get giddy around each other! It is so easy and you will LOVE it, Ashley! The father in law just dropped off a huge bag of apples for us! Yippee! Now I have an idea as to what to do with them! I love all the cooking going on in your neck of the woods. 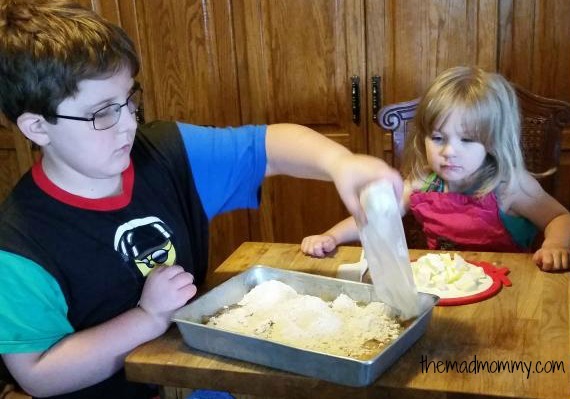 Isn’t cooking one of the BEST homeschool activities?! I love incorporating cooking! Math, Science, Art, History, almost everything can be taught through food! Not to mention setting them up with an awesome life skill! You are so awesome!! I love these posts of yours so much (dare you to write on on homemade whisky in a jar for the holidays – somebody once gave me homemade irish cream and OMG so good). Pinned it, baby! And EEEP to your kids getting so involved. I love that. LOVE. Don;t be surprised if a little Whiskey In the Jar shows up on your door step! It might just be the Welcome Home you are looking for! Thanks for pinning, my friend! You and Tucker could make this together! Whaaaat?? Ice cream made from coffee creamer? Now that’s brilliant. Looks like a great recipe for the kids. It is so awesome! Creamy, rich and totally decadent! It was so fun and easy to make! Not to mention, DELICIOUS! Thanks for pinning, B! It is delicious, but you know all about delicious! I am drooling over your cupcakes! My chefs are pretty adorable! This is a fantastic fall recipe! I love simple yet scrumptious recipes like this apple dump cake! I don’t have an ice cream maker but that won’t stop me from making this recipe. Thanks for linking up on WhateverWednesday! I think you could make this ice cream without a machine too! Although, now is the time when the machines go on clearance! Thanks for linking up at #WhateverWednesday! Just a little supervision and they made the entire dessert! It is so much fun to teach them these things and watch their faces light up! Love dump cake! I actually just saw this made for the first time on Pioneer Woman! I need to make this soon 🙂 Glad it turns out!! It turns out great! As you can see, we did an apple pie twist on ours! Thanks for linking up the the Bloggers Brags Pinterest Party! Your post has been pinned to the Bloggers Brags Pinterest Board 🙂 Wow! My mouth is watering just reading this! I must eat this cake! Thank you for sharing your recipe. It is so delicious and easy! They love seeing themselves accomplish the meal too! It is so much fun! Great recipe!! Your kiddos are adorable 🙂 And how delicious is cinnamon ice cream!! I was skeptical of cinnamon gelato, but holy cow was it good!! They are kind of cute, eh? 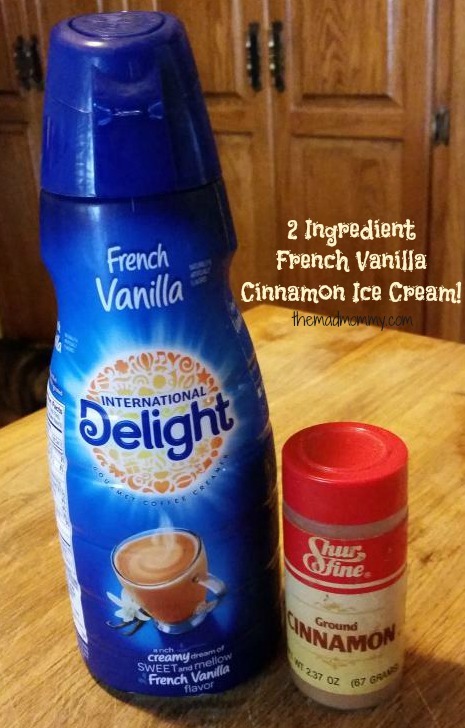 The French Vanilla Cinnamon Ice Cream is so rich and delicious! I love it! 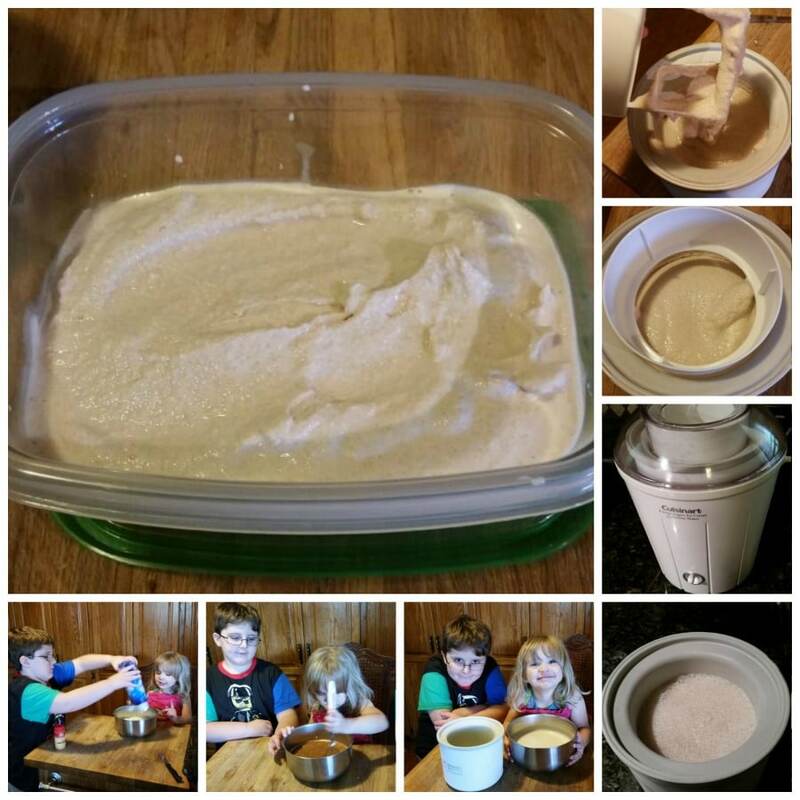 fun, delicious and kid approved – total win!!! Oh my! Yummo! This looks absolutely wonderful and I love the Cinnamon Ice Cream! Lil man loves cinnamon anything! LOL! For 2 years, the only sandwiches that he would eat were cinnamon butter sandwiches! I really wish I had an ice cream maker! I miss homemade ice cream! Have a great weekend! Ice cream makers go on clearance at the end of summer!!!! This looks yummy! I love that the ice cream is COFFEE CREAMER!! I should’ve thought of that one! 😉 Thanks for linking up with me and my lovely co-hosts at Pin Worthy Wednesday! I’ve pinned your post! Thanks for pinning it! I hope you try it! I love dump cakes… and this one looks amazing! And that ice cream… love it!! 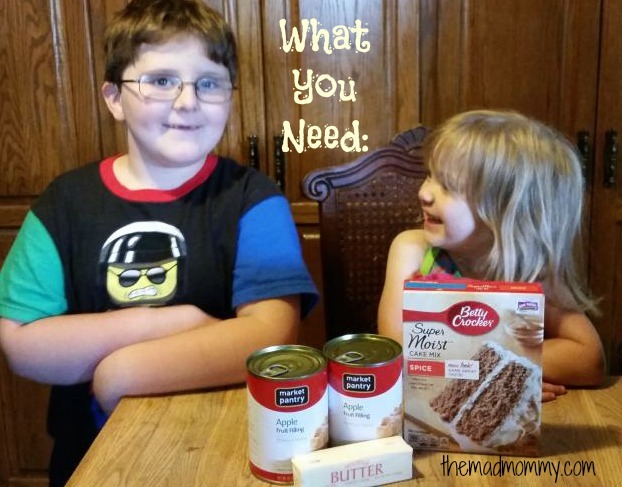 Thank you so much for linking up to Creative K Kids Tasty Tuesdays. I’ll be pinning this to the Tasty Tuesdays board. I would love if you linked up again with us this week! This look delicious! Thank you for linking up with us at Tickle My Tastebuds Tuesday last week! I am featuring you this week and would love if you would stop by and link up more yummy recipes! Love these two recipe ideas! Who knew you could make French Vanilla Ice Cream with just two ingredients?! I teach a kid’s cooking class so will definitely be using these and following along with the other #kidsinthekitchen posts. One question … do you think you could make a few smaller apple dump cakes instead of big ones? This looks delicious! I love that the kids could help with it so much! I’d never heard of Curious Chef but I’m loving their products (I’m thinking awesome Christmas presents!) My daughter would love the cupcake decorating kit best, I think! I used to make dump cake a lot, now I have to watch the sugar for my husband, but if we have company I make it for them. Love that the kids can help!! This is such a cool idea. I really want to try this. I like that it’s easy too. Thanks for sharing at Saturday Dishes! Pinned!